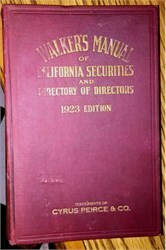 We are offer various dates of the Walker's Manual of California Securities and Directory of Directors. Each manual includes over 600 pages of company information including financial, ads, maps, etc. and an index of the companies listed in the book. This is a great resource of California and Pacific Stock Exchange companies.